The hacker group known as Anonymous, who has leveled its ire at the Tea Party and WikiLeaks opponents, has taken on a more sinister enemy: snow. Anonymous is a loose group of hackers and activists that has variously attacked "worthy" foes such as PayPal and PostFinance for their criticism of WikiLeaks founder Julian Assange and the Oregon State Tea Party for co-opting the group's slogans. The Church of Scientology is a favorite target, but in truth no one is above the ire of the Anonymous collective. Even the President for Life of the KISS army, Gene Simmons, is not beyond the reach of Anonymous, who has performed denial of service attacks against Simmons' websites for his comments on vigorously suing to protect his intellectual property. But these days, they are searching for loftier targets, and Anonymous has settled on the one thing that many people in the Northern Hemisphere are currently dreading: snow. In an image supposedly released on 4chan yesterday, Anonymous has called for an all out assault on the fluffy white stuff that clogs the wheels of America's highways. "Snow is the very definition of everything we hate," the announcement reads. "Snow has been trolling us for millenia and now it's time to troll it back. We have the chance to fight the first internet-weather war in history. We will not sit idly by." The plan for Operation Frozen Vengeance is simple, or terribly convoluted. 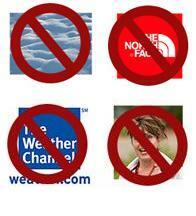 Step one is not to get a box, but to attack the Weather Channel and North Face websites. "We must send the message that we will not tolerate collusion with frozen precipitation." Finally, you are all urged to forgo wearing coats and hats to shed the yoke that cold weather and snow has on dictating what we adorn our bodies with. Unfortunately, Anonymous' efforts have so far been ineffective. Weather.com and thenorthface.com are still functioning and snow continues to fall. Here's the full image for your viewing pleasure. 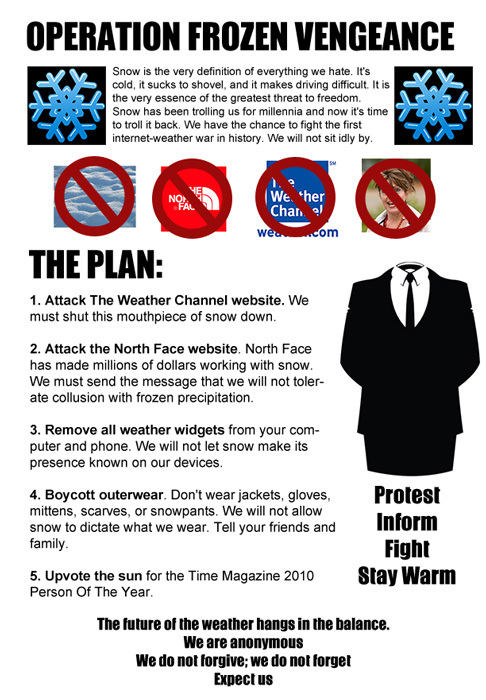 Keep in mind that we do not know if this is a real initiative from a member of Anonymous or 4chan, or if someone is satirizing the group by co-opting its slogans and modus operandi for this counter attack on the weather terrorism that snow has subjected on the world.